I've been here in Bishop climbing for about a week now. I've done some really good new things here in the Tableland. In some of the lesser known areas mega developement is being done. I've been climbing a lot of these new things and they are awesome. 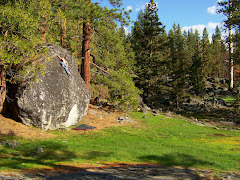 I did the 2nd ascents of James Thick Pie v11 and Subzero v11. James Thick Pie came easier because of my height but the other one was quite a feat. Relentless upside down climbing from one crux to another. I feels good to start getting back in shape a little. It is so fun to be here again for a while to climb in these cool areas with all of my friends. There are a lot of problems that I still want to try here. My trip here continues for 3 weeks. I plan on trying a lot of problems. It would be nice to do them all. But we'll see. Where is all the new development? Developement is in Tablelands. It's one of those secrets that everyone knows about. I'll show you sometime.